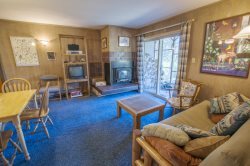 The Meadows - hot tub - condo upgrades! You will be so happy this condo is beautifully remodeled with all the fine touches. Enjoy the stainless steel appliances with a larger refrigerator, compact dishwasher and Corian countertops and backsplash. The kitchen is fully equipped along with a gas Avanti stove. The rustic décor adds charm, while the balcony and wood burning fireplace allow you to take in the crisp, mountain air or cozy up when it’s time to wind down. Relax in two very comfortable chairs while watching your favorite videos and sleep on a real queen bed. Dine on a beautiful round wood table with comfortable seating for 2. This kitchenette comes with everything you need including a rolling island for more food prep or work space. There are ski lockers available in the common area. The Meadows also has a hot tub during the winter months but is not always guaranteed. We provide the following amenities: dining table seating for 2, full kitchen includes: Avanti gas stove, larger refrigerator, rolling island, compact dishwasher, microwave, coffee maker, basic pots and pans, dishes and silverware. Flat Screen TV, No cable, DVD Player, CD/cassette tape/radio player, 2 lounge chairs. This property is not pet friendly, however pets have been here in the past. Everyone was fantastic. Great communication & instructions. I had a issue and got locked out of my room and the team was able to unlock the door remotely right away. Loved the property. Really cool and convenient space that was terrific value. I loved Kirkwood... very quirky place ;) But all the instructions had me plenty prepared with enough groceries, etc and it was actually really fun being snowed in! Also had some of the most uncrowded powder days of my life because nobody could get to the resort.